Home>News>News>PRI Rating: the best score for Mirova! PRI Rating: the best score for Mirova! 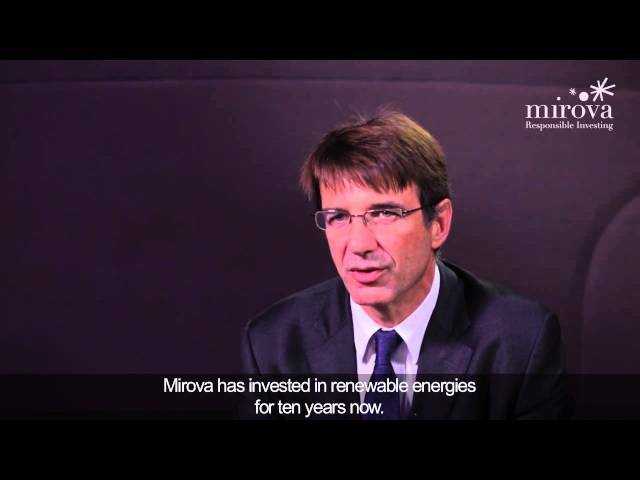 As a signatory of the PRI (Principles for Responsible Investment) since its inception, Mirova has placed sustainable development at the heart of its approach and investment policies. The quality of its commitment is recognized by the PRI. Launched by investors in collaboration with the United Nations Environment Program Financial Initiative (UNEP FI) and the UN Global Compact, the PRI initiative engages with an international network of signatories to implement the Principles for Responsible Investment. It aims to identify the links between investments and environmental, social and governance issues, and to support the signatories to integrate these issues in their investment and shareholder decision-making process. At the end of the annual PRI 2016-2017 evaluation cycle, scores achieved by Mirova, compared to those of all the signatories, reflect the quality of its approach to responsible investment with an A+ (maximum score) for all its investment capabilities and modules. The table shown above is the summary of the evaluation report. It is designed to provide feedback to signatories to support ongoing learning and development. A brief description of the information presented in each section of this report and how it should be interpreted is presented below. This indicator scorecard summarises the scores achieved for each core and additional assessed indicator within each module. It also provides basic information about the performance of the organisation compared with other signatories that responded to that indicator. The number of stars determines an overall module score. Please refer to the assessment methodology summary for additional information about how these scores are calculated. Each module is divided into several sections. The total number of stars that can be achieved in each section are added together and presented in a spider chart. The total aggregated performance band for each module will be compared to peer groups in a series of distribution charts. Reference to a ranking and/or an award does not indicate the future performance of the fund manager. Natixis Asset Management U.S, LLC (Natixis AM U.S.) is a U.S.- based investment advisor that is majority-owned by Natixis Asset Management, S.A. (Natixis AM) and minority-owned by Mirova. Mirova is operated in the U.S. through Natixis AM US. Natixis AM US and Mirova entered into an agreement whereby Mirova provides Natixis AM US investment and research expertise, which Natixis AM US then combines with its own expertise, and services from Natixis Asset Management when providing advice to clients. The Natixis Asset Management organization includes Natixis AM, a Paris-based asset manager and Natixis AM U.S., a Boston-based investment adviser. This document is intended for Professional clients only in accordance with MIFID. If no and you receive this document sent in error, please destroy it and indicate this breach to Mirova. Products and services do not take into account any particular investment objectives, financial situation nor specific need. Mirova will not be held liable for any financial loss or decision taken or not taken on the basis of the information disclosed in this document, nor for any use that a third party might make of this information. This documentin no way constitutes an advice service, in particular an investment advice. This document is a non-contractual document and serves for information purpose only. This document is strictly confidential and it may not be usedfor any purpose other than that for which it was conceived and may not be copied, distributed or communicated to third parties, in part or in whole, without the prior written consent of Mirova. This document may not be used in some jurisdictions where such offers or promotions have not been authorized by the competent authorities. Each investor must ensure he complies with these requirements and prohibitions.No information contained in this document may be interpreted as being contractual in any way. Information contained in this document is based on present circumstances, intentions and beliefs and may require subsequent modifications. No responsibility or liability is accepted by Mirova towards any person for errors, misstatements or omissions in this document or, concerning any other such information or materials, for the dequacy, accuracy, completeness or reasonableness of such information. While the information contained in this Document is believed to be accurate, Mirova expressly disclaims any and all liability for any representations, expressed or implied, with respect to this Documentor any other written or oral communication to any interested party in the course of the preparation of information concerning the Fund. Prices, margins and fees are deemed to be indicative only and are subject to changes at any time depending on, inter alia, market conditions. Mirova reserves the right to modify any information contained in this document at any time without notice. More generally, Mirova, its parents, its subsidiaries, its reference shareholders, the funds Mirova manages and its directors, its officers and partners, its employees, its representative, its agents or its relevant boards will not be held liable on the basis of the information disclosed in this document, nor for any use that a third party might make of this information. This document has been created and prepared by Mirova based on sources it considers to be reliable. However, Mirova does not guarantee the accuracy, adequacy or completeness of information obtained from external sources included in this document.